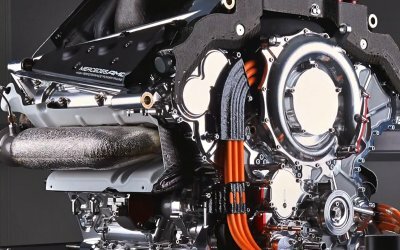 It means that the plans for a threatened standard engine will be shelved and hybrid turbos will be the default power unit for F1 until 2020. All teams are guaranteed to have an engine so there will be no repeat of Red Bull’s situation last season. Electric cars are already coming fast, the Tesla 3 is sold out before the 1st one has rolled out the factory. An even cheaper model is in development. So electric propulsion has be a bigger part of the new engine. MGU-K should be doubled or ecen trippled to approx. 300Kw. To prevent +1000hp powerunits, the ICE will have to be smaller. Porsche built a great V4 or maybe cut the V6 in half, to an inline 3 cilinder. Anyway the next generation f1 will probably have smaller then 1L displacement. The hybrid turbo is an important part of the current hightech engine and recovered energy feeds the MGU-K. But also a big problem to implement by manufacturers and it makes the PU very expensive and complex. So will it be there in 2021? I'm not so sure. I think a downsized v6, maybe 800cc. ... And I think we would get similar lap times to the current spec!! gruntguru wrote: Fuel flow 70 kg/hr. I guess that depends on what sort of power/efficiency they end up with in a couple of years' time and the amount of power given the ERS. Zynerji wrote: I think a downsized v6, maybe 800cc. If they were going to 800cc I like the idea of a triple. Basically half the V6, so some money should be saved there. Or a 1.2l V4, which should suit the chassis people better. They should allow front wheel energy recovery, but not deployment. That should all go through the rear wheels. I don't think they need triple the battery capacity. With the flows in and out they may not need the capacity they have now. What they would need is an increase in the amount allowed to be recovered (currently 2MJ) and deployed (4MJ) to/from the ES. And aren't the current turbos twin scroll (turbine) already? And if they did the triple the turbo would not need to be twin scroll. Definitely a V configuration for the chassis symetry (why the I4 got scrapped for the current V6). I like the front wheel ERS deployment... maybe put them on triggers on the wheel to allow the driver to "boost" them independently to aid in cornering or overtaking. I would uncap all limitations on MJ for storage and deployment. And all BMW 3 cylinder engines come with a twin scroll turbo due to the spool up RPM at about 1250 instead of 3200. Not a big deal with MGU-H, but single scroll technology is obsolete in the automotive world, so should not be part of the most technological motorsport on the planet. A V4 as from the calculations I have seen it will be more efficient. Why not run the cars on natural gas? The sport is trying to be clean, natural gas is about the cleanest fossil fuel you can burn. I was thinking along the lines of 300kW MGUK over 4 wheels. That would enable a lot more harvesting and electric drive power. Such a car would be as fast as the current cars with a lot less fuel. trinidefender wrote: A V4 as from the calculations I have seen it will be more efficient. If they could use pit stop swappable CNG fuel pods, that would be amazing! ergenomic wrote: No ICE. Electric only.??? I'd be surprised. I would only expect F1 to go fully electric once formula e has proven the technologies and is starting to challenge F1 in performance. Whilst things like car changes and short slow tracks are OK for F e, they certainly wouldn't be for F1. Maybe around 2030? When does the ACO update their guidelines? The F1 guidelines were designed to be compatible with those. So (going OT) Honda could put their F1 engine into the HPD LMP1 car and be legal from the off. Variable valve timing and lift. MGUH only on charging events. Exhaust turbine but no compressor? Yes. No compressor. I had this concept posted a few years ago. to imporve the sound. Only a portion of the gases only route through the turbine during charging events. A fairly low backpressure turbine. The rest of energy comes from the four wheel KERS.